When most of us see a goomba, our instinct is to try to squash it, get rid of it. Turns out, though, that goombas can be way more useful than that. Last year, I profiled Scott Buchanan, an intense Super Mario 64 player who manages to beat levels without ever jumping at all. This month, he’s back with a new feat that takes place within Super Mario 64’s earliest level, Bob-omb Battlefield. 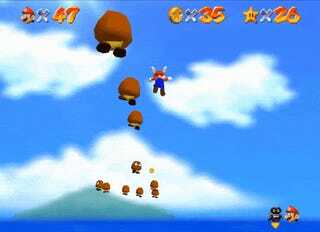 Specifically, the second to last star on that level, “Mario Wings To The Sky.” As veteran players know, that star requires players getting to an island in the sky, where you’ll find a wing cap that you can use to collect five coins. These coins make the star appear—really, its a simple star to get...if you get it the normal way. In 2013, Buchanan managed to nab the star with a record of only one jump press (required to use the cannon that could shoot him to the coins in the sky). When Mario grabs an object regularly (either while standing still, or while walking), it takes two frames to send a signal to the object to prevent it from unloading while Mario is holding it. However, if the [object] unloads during these two frames, Mario will be holding a vacant slot, which can be filled with any other object as they load as Mario approaches them. (i.e: When Mario is holding a vacant slot, and a coin is loaded in that slot, Mario will be holding the coin, and can throw it to collect it. And after unloading and loading the coin again, it will reappear thus Mario “cloned” the coin. It is possible to hold a vacant slot by other ways including grabbing a Bob-omb as it explodes, grabbing a cork box as it breaks. Expand them to see it in its full glory. These documents show just a few of the many calculations that Buchanan had to do in order to figure out the placement of all the goombas. 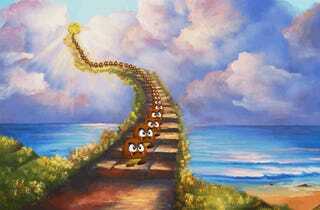 Coming up with the goomba staircase method was not easy, and grabbing the star in a straightforward manner would have been the less impressive feat. But earning the star normally does require jumping, and Buchanan is in the business of doing as little of that as possible—even if it necessitates incredible workarounds, and an encyclopedic knowledge of how Super Mario 64 works. As always, Buchanan continues to try to beat Super Mario 64 in as few jump as possible here. Correction: this article originally misidentified what star number this was, as well as the number of secret coins required to collect it. This has been amended to the actual numbers!